Dormer additions are one of the most economical home addition projects you can consider when looking to gain more living space in your home. 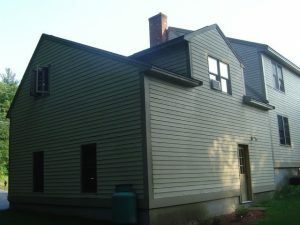 Dormer addition benefits are many and they are particularly useful in Cape Cod or Gambrel style homes as they can provide additional natural light and more ceiling headroom to the upper level rooms. A bump-out dormer addition is also a great idea for an attic conversion project. Dormer additions are also excellent for small single story homes as they can create kitchen nooks and window seat areas, while letting in natural light. This fact can help mitigate the inconvenience to the family during the construction of the dormer addition. There are two dormer addition styles that you can choose from. First, there is the shed dormer. A shed dormer has a roof line that sits parallel to the existing roof that it ties into. It is relatively easy to construct and has the lowest installation cost. Shed dormers are typically constructed on the back or side of a home. They are less frequently used on the front of a home. The second dormer addition style has a gable roof style. A gable roof style dormer addition has a roof line that sits perpendicular to the roof line that it ties into. A gable roof style dormer has a traditional roof look with two sloping sides that tie into their own ridge. A gable style dormer addition is more attractive than a shed dormer and thus is more frequently used on the front of a home. A shed dormer is typically lower cost to construct than a gable roof dormer addition as its roof structure is simpler to build. Dormer additions can also add character to a home if designed and built correctly. By including soffits that are consistent with the rest of the home and the use of specialty windows, the dormer addition can transform an otherwise boring roof line into an eye catching home. Also, when designing the dormer addition make sure its roof line sits below the level of the ridge line of the main roof. In addition, dormer additions should be designed to accent a home and its roofline. Consequently dormer additions should be kept relatively small compared to the size of the room. Instead of building one large dormer addition you may want to consider two smaller dormer additions. Installing a dormer addition is fairly complicated and thus it is not meant for the weekend do-it-yourself homeowner. Consequently it is important to find a qualified and professional home addition contractor when planning a dormer addition. Hiring the wrong contractor could lead to an eyesore globed onto the roof of your home if not careful. To find a qualified and professional home remodeling contractor you may want to consider one of the national home building contractor referral companies. When obtaining dormer addition contractor quotes from contractors it is important to make sure that they provide you with a complete home addition cost breakdown list of every phase of the project. The more detail in the home addition cost breakdown list, or bid sheet, the more likely an accurate home addition cost proposal. 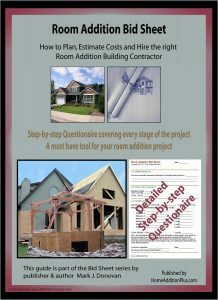 To help in obtaining accurate and consistent home addition contractor quotes, see my Home Addition Bid Sheets. They provide a “request for quote” section that you can provide to prospective building contractors. They also each include a comprehensive home addition cost breakdown table, in Microsoft Excel format, that allows the contractor to include his projected home addition costs for every phase of the project. When interviewing potential home addition contractors make sure to check their references. Usually a good litmus test for evaluating a home addition building contractor is to see how long their reference list is. Regardless of the length of the reference list, it is important to contact at least 3 or 4 of the references. Contact a couple of more recent projects completed by the contractor and a couple 2-5 years out in the past. You may also want to visit, or drive by the references to see their work first hand. This way you can see how the contractor has been trending with his work, as well as to see how his work has held the test of time. So if you are looking to add a little more living space to your home and/or desire more natural light, then a dormer addition may be the right choice for you. By planning ahead and hiring the right home addition contractor you can ensure a smoother dormer addition project.